Ductile iron pipe is lighter, stronger, and more durable than cast iron. The difference between cast iron and ductile iron is the graphite form. In ductile iron, the graphite form is spheroidal, or nodular; in cast iron, it is in a flake form. The spheroidal or nodular form of graphite found in ductile iron is accomplished by adding an inoculant, usually magnesium, to the molten iron during the manufacture process. Ductile iron can be identified in a laboratory setting by using a spectrograph to examine its exact composition, or by using a tensile test. It can be hard to tell the difference between iron and ductile pipe. Examine the pipe. Look at how weathered it is. Ductile pipe was first created in the 1950's. It was first sold commercially in the 1960s, with most installations being done in the 1970s or later. If the pipe is older than that, then it is cast iron. Cast iron pipes have been around much longer than ductile pipes, which eventually replaced them. Cast iron pipes, in a configuration similar to ductile pipes, have been used actively in North America for at least one hundred fifty years. Another indication as to whether a section of pipe is ductile or cast is its smoothness. Cast iron is generally smoother than ductile. 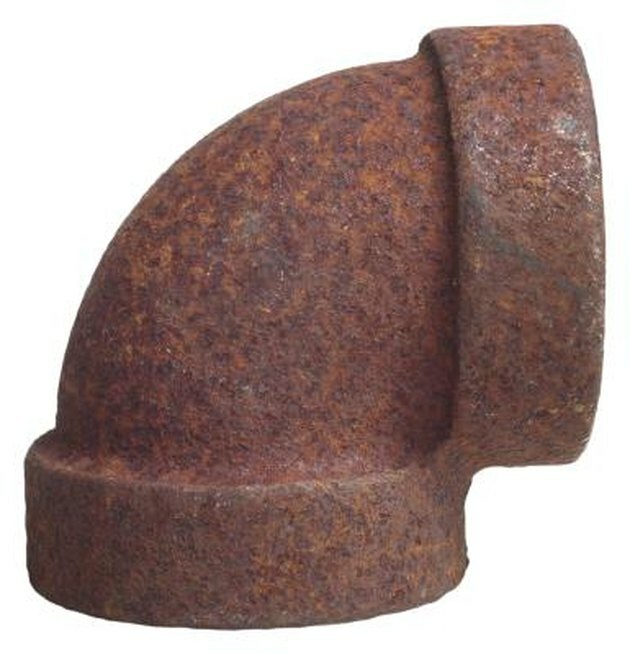 Most ductile is produced with a noticeable "peen" pattern, as if someone had been beating it with a hammer. Look for markings on the face of the bell flange. Most ductile pipes have the letters "D I" or the word "Ductile" cast directly into the face of the bell flange. No cast iron pipes have these markings. Look for markings on the outside of the pipe. Both cast iron and ductile pipe are painted with one or more class markings at the factory when they are produced.Cast iron has a class number in the 20s. Ductile class numbers have gone through several revisions. When ductile pipes were first introduced, they were given class id markings between "2" and "6." Later, in about the 1970s, a thickness class was introduced. Ductile pipes produced at this time bore markings from between "50" and "56." Later on, in the 1990s, pipes began being marked to indicate how many pounds of pressure per square inch they could withstand. Most ductile iron pipes are created to withstand 150 psi to 350 psi depending upon the thickness of the pipe. Make a laboratory identification by using a spectrograph to examine the exact composition or by using a tensile test. Cast iron has an ultimate strength of 20,000 psi. The ultimate tensile strength of ductile iron is above 60,000 psi, the yield strength is 42,000 psi. During the testing ductile iron will elongate by about 10 per cent before breaking. This test result sequence is frequently written as 60 - 42 - 10. Virginia Grant wrote her first cookbook "Wholly Crepe" in 2008 and has since added "Easy Roasts," "A Deep Beauty," "Breaking Up The Big Banks" (with T.J. Walker) and an ACC "Guide to Long Island Sound." She has been a business analyst, law librarian and paralegal, and real estate broker. What Is the Yield Strength of a Schedule 80 Galvanized Steel Pipe?